I am a Professor in the Department of Systems Biology at Harvard Medical School and a member of the Harvard Wyss Institute. I am also a member of the Harvard University Graduate Program in Systems Biology , the Harvard Medical School BBS Graduate Program and the Harvard Biophysics and Chemical Biology Graduate Programs. I am interested in lots of things ranging from Systems to Synthetic Biology as are the members of my lab. I am also involved in a number of educational efforts the International iGEM competition. If you are interested in joining the group or requesting a reagent go to Silver Lab at OpenWetWare. I welcome applications from interested scientists at all levels (undergrad to postdoc) and from just about any background. Pamela Silver received her BS in Chemistry and PhD in Biochemistry from the University of California where she was an NIH Pre-doctoral Fellow. She was a Postdoctoral Fellow at Harvard University in the Dept of Biochemistry and Molecular Biology where she was a Fellow of the American Cancer Society and The Medical Foundation. Subsequently, she was an Assistant Professor in the Dept of Molecular Biology at Princeton University where she was an Established Investigator of the American Heart Association, a Research Scholar of the March of Dimes and was awarded an NSF Presidential Young Investigator Award. She moved to the Dana Farber Cancer Institute where she was a Professor in the Dept of Biological Chemistry and Molecular Pharmacology at Harvard Medical School. She was named a Claudia Adams Barr Investigator and awarded the Mentoring Award for the PhD Program in Biological and Biomedical Sciences at Harvard Medical School. In 2004, she became one of the founding members of the Department of Systems Biology at Harvard Medical School and the first Director of the Harvard University PhD Program in Systems Biology. In 2009, she became one of the first members of the Harvard University Wyss Institute for Biologically Inspired Engineering. Her work was recognized by an Innovation Award at BIO2007 and has been funded by grants from the NIH, DARP, DOD, DOE, NSF, Novartis, Merck and The Keck Foundation. She was awarded an NIH MERIT award and she was a Fellow of the Radcliffe Institute. She has served on numerous government and private advisory panels including the NIH Pioneer and Innovator Award Committees, the NAS/NRC Study on Network Science, the OSD/NA Biodefense Workshop, the Jane Coffin Childs Memorial Fund, the Novartis Oncology Program, the Swiss National Science Foundation and the Paul Glenn Institute for Aging Research. 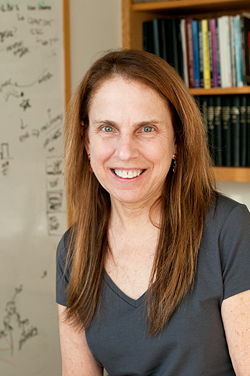 In 2012 she was named the Elliot T and Onie H Adams Professor of Biochemistry and Systems Biology at Harvard. She has served on numerous editorial boards including Nature Molecular Systems Biology, BMC Systems Biology, Genes and Development, Synthetic Biology and PLoS One. She was the Editor of Molecular Biology of the Cell and has served on the Council of the American Society for Cell Biology and on the Committee for Women in Cell Biology. In her free time, she enjoys sailboat racing and running - she has competed in several Boston Marathons and races a Viper 640 throughout the East Coast. This page was last edited on 9 April 2015, at 10:12.